Mithu Basu: Yet again, Dolna to bring alive the Mercedes Benz evening of celebrations. Yet again, Dolna to bring alive the Mercedes Benz evening of celebrations. Friends yet again, Dolna will bring alive a prestigious corporate celebration with live art and dance. 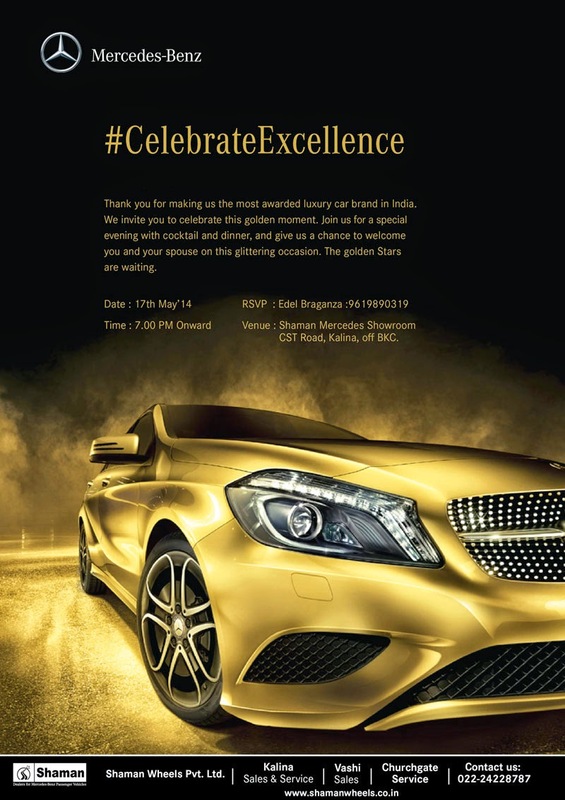 17th May will see Mercedes Benz celebrate a season of accolades while Shaman Mercedes unveils the glittering spectacle of its golden stars, over cocktails and hors d'oeuvres. Artist Subodh Poddar will capture live on canvas the riot of colours and the spirit of dance choreographed by Nikhil Anand. The evening conceptualized by Mithu Basu, Founder, Dolna, the movement is sure to etch unforgettable memories forever in time. Though it is 'by invitation only', I wish you to know and count on your best wishes to keep the 'art n events' flag fly high.